LIFE IS BEAUTIFUL: 1807115. Wednesday, 11th JULY St Benedict, abbot. 1807115. Wednesday, 11th JULY St Benedict, abbot. The names of the twelve apostles are these: first, Simon, who is called Peter, and Andrew his brother; James the son of Zebedee, and John his brother; Philip and Bartholomew; Thomas and Matthew the tax collector; James the son of Alphaeus, and Thaddaeus; Simon the Cananaean, and Judas Iscariot, who betrayed him. St Matthew gives us the list of the twelve Apostles (including himself). If you give a list of people in your class, for instance, you don't have to say 'first', because it's not a classification. You write them in random order or just in alphabetical order. St Matthew starts the list saying: "first, Simon, who is called Peter." St Mark (3:13-19) and St Luke (6:12-16) also give us a list of the Apostles. In actual fact, St Luke does it twice, because in the Acts of the Apostles (1:13-14) he mentions them again. In all these lists the Apostles' names are mentioned in a different order, except for Peter: in the four lists he is always mentioned first. Another interesting point is that if you say: 'this is the list: first, Peter', then you expect the text to continue with the word... 'second...' But in St Matthew's list there is no 'second'. There is only one 'first' and then eleven more. Since the Apostles at times had been discussing who was the first among them, Jesus solved the riddle before He ascended into Heaven: Peter was. First things first: "First, Simon, who is called Peter." St Peter gave unity to the twelve. We find him solving the problems that arose after Jesus' Ascension. Today our Peter is called Francis and he needs our prayers. Mons. Chichester, bishop of Salisbury (Zimbabwe) once surprised Pope Pius XII with this question: "Your Holiness, do you sleep well at night?" The Pope, amazed, replied, "Yes, I do ... but why do you ask me that?" "When I was little," the African bishop replied, "a lady used to take care of us. Every night, when she got us into bed she prayed with us one Hail Mary 'for the Pope of Rome, so that he can sleep peacefully despite his many concerns.' I have always been praying it, and, to be honest, I was curious to know if it works." It certainly does! 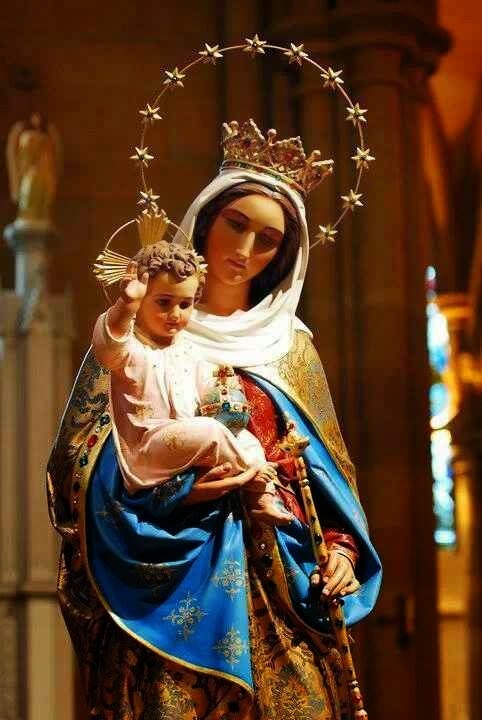 Holy Mary, Queen of the Apostles, Mother of the Church, pray for Pope Francis! Amen. Christianity started from humble beginnings. The first apostles of the Church were certainly not intellectuals, highly educated or schooled in the rabbinic tradition. In the gospel, Jesus chose the Twelve to be His apostles. They were a motley crowd. Most were not educated and were fishermen. We have Matthew, a tax collector, and a political revolutionary in the person of Simon the Zealot; and a thief and traitor in Judas Iscariot. Clearly, then the Church was a Church of the poor. Until the conversion of Emperor Constantine, the Christian Faith was an outlawed religion. Christians were persecuted and some were put to death for their faith in the first 350 years of the foundation of the church. Many who became Christians were the marginalized and outcasts of society and rejected by Judaism. Of course, eventually, some rich and influential people came to know the Lord and were converted. Generally, the Church was poor so that they became dependent on the power of God. Not only was the Church of the poor but she was also for the poor. Jesus was sent for the poor. His mission began by a citation from the Suffering Servant of Isaiah. "The Spirit of the Lord is upon me, because he has anointed me to bring good news to the poor. He has sent me to proclaim release to the captive and recovery of sight to the blind, to let the oppressed go free, to proclaim the year of the Lord's favor." (Lk 4:18f) The poor included not only all those who were materially poor, but those who were suffering from physical, spiritual and psychological wounds. Right from the outset, in the proclamation of the Good News, Jesus "summoned his twelve disciples, and gave them authority over unclean spirits with power to cast them out and to cure all kinds of diseases and sickness." Jesus was identified with every man and woman who was suffering. "That evening they brought to him many who were possessed with demons; and he cast out the spirits with a word, and cured all who were sick. 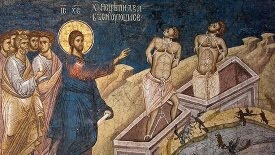 This was to fulfill what had been spoken through the prophet Isaiah, 'He took our infirmities and bore our diseases.'" (Mt 8:16f) The disciples were to continue the healing work of our Lord in the proclamation of God's reign of love and justice for humanity. However, in many places today, the Church is neither the Church of the poor nor the Church for the poor. How did this happen? It began with the expansion of the gospel to the Greek-speaking countries. The people were either polytheists or philosophers. The Greek cities were flourishing because of trade. As a result, like in all affluent countries, the sins of greed, lust, excessive drinking and cheating prevailed. However, the Christian missionaries had to give an account of their faith to the intellectuals of society. As a consequence, there grew a number of apologists for the Christian faith that sought to prove that the Catholic Church is the true Church of Christ and that Jesus is our Lord, God and Saviour. So it could not be avoided that an intellectual discourse was necessary to give a reason for our faith in Christ. So faith was moving towards reason as the basis for belief. Then, after the conversion of Emperor Constantine to the Catholic Faith, the whole of Europe became Christians. There were mass baptisms as many wanted to be identified with the king. But it also meant that many were converted not because of faith in Christ but because of political and business considerations. With the influence of the courts and nobilities, the Church grew to be very powerful till the Reformation when the Church was at its height of corruption and scandals. From simplicity, the stress was on beauty and solemnity. The Cathedrals and churches and liturgical celebrations became more and more solemn. Later, Latin was introduced and eventually became the language of the Church. But for who were not so educated, they were left to simply cultivate devotions to replace the liturgical celebrations which were meaningless to them. Thirdly, the Church today is the Church of the Middle Class for the middle class. It must be noted that the Church was instrumental in promoting education and sciences in the world. Many of our Catholics received good education and most of them are doing well. But it also means that we are no longer the Church of the poor for the poor. We just have to consider those who go to Church. A large part of our congregation is made up of ordinary people, some are not even educated. Yet, we cannot run from the fact that our congregation is largely English-educated. Our faith and missionary activities have failed to penetrate the heartlands of Singapore where many are less educated, speak Mandarin, Tamil and dialects. These are the workers, the labourers who have to take up two jobs to feed the family. Of the friends-in-need served by our St Vincent De Paul, 80% are not even Catholic! Indeed, the condemnation of the Israelites in the first reading applies to us as well. "Israel was a luxuriant vine yielding plenty of fruit. The more his fruit increased, the more altars he built; the richer his land became, the richer he made the sacred stones." They too were rich and prosperous. But they became self-sufficient, arrogant and immoral. This is always the temptation of the rich. When they are consumed by their wealth, power and luxuries of life, God is out of the equation. They forget that what they have today is the blessings of God. Instead, they credit themselves for their hard work and ingenuity. In truth, without God's grace we cannot be where we are today. So being rich and powerful can also be our downfall as it was for the Northern Kingdom. God will strip us as He did of our riches, power and knowledge. He said, "Their divided heart; very well, they must pay for it; the Lord is going to break their altars down and destroy their sacred stones. Samaria has had her day. Her king is like a straw drifting on the water. The idolatrous high places shall be destroyed – that sin of Israel; thorn and thistle will grow on their altars." Let us not think too highly of our achievements because when tragedy strikes in the form of illness, adultery, changing political and economic conditions, we might lose everything that we have. That time, it would be a bit too late for regrets. Consequently, we must return to the simplicity of the gospel. Jesus did not choose His apostles to debate with the intellectuals. St Paul said, "For the message about the cross is foolishness to those who are perishing, but to us who are being saved it is the power of God. For it is written, 'I will destroy the wisdom of the wise, and the discernment of the discerning I will thwart.' Where is the one who is wise? Where is the scribe? Where is the debater of this age? Has not God made foolish the wisdom of the world?" (1 Cor 1:18-20) In the final analysis, God cannot be proven or be disproved. We have great intellectuals and scientists who believe in God and some do not. At the end of the day, the Good News must be preached with the heart of conviction and compassion. It is in our outreach to the poor, healing the sick, welcoming the wounded, being humble in service, stripped of the glory of the earth, that we will win hearts for Christ. Our churches today are becoming too arrogant because of wealth, power and status. We seem to welcome only the healthy, the rich and those who are not a "nuisance" to us. We have become too bureaucratic, officious and out of touch with the poor and the suffering. The ordinary people no longer feel comfortable or welcome in our churches. But Jesus makes it clear, "Those who are well have no need of a physician, but those who are sick. Go and learn what this means, 'I desire mercy, and not sacrifice.' For I came not to call the righteous, but sinners." (Mt 9:12f) This is what Pope Benedict wrote, "We have come to believe in God's love: in these words the Christian can express the fundamental decision of his life. Being Christian is not the result of an ethical choice or a lofty idea, but the encounter with an event, a person, which gives life a new horizon and a decisive direction." (Deus Caritas Est 1) That is why Pope Francis wants the Church to be simple and welcoming to the poor, the lowly and the needy. So let us, beginning with ourselves, constantly seek His face first before we proclaim the gospel to all of humanity. That is why the Lord instructed the disciples, "Do not turn your steps to pagan territory, and do not enter any Samaritan town; go rather to the lost sheep of the House of Israel. And as you go, proclaim that the kingdom of heaven is close at hand." We need to renew our Catholics first, before we send them out as apostles and witnesses of Christ. Indeed, this is what the prophet is exhorting us. "Sow integrity for yourselves, reap a harvest of kindness, break up your fallow ground: it is time to go seeking the Lord until he comes to rain salvation on you." St. Benedict, blessed by grace and in name, was born of a noble Italian family about 480. When a boy he was sent to Rome, and there placed in the public schools. Scared by the licentiousness of the Roman youth, he fled to the desert mountains of Subiaco, and was directed by the Holy Spirit into a cave, deep, craggy, and almost inaccessible. He lived there for three years, unknown to any one save the holy monk Romanus, who clothed him with the monastic habit and brought him food. But the fame of his sanctity soon gathered disciples round him. The rigor of his rule, however, drew on him the hatred of some of the monks, and one of them mixed poison with the abbot's drink; but when the Saint made the sign of the cross on the poisoned bowl, it broke and fell in pieces to the ground. After he had built twelve monasteries at Subiaco, he removed to Monte Casino, where he founded an abbey in which he wrote his rule and lived until death. By prayer he did all things: wrought miracles, saw visions, and prophesied. A peasant, whose boy had just died, ran in anguish to St. Benedict, crying out, "Give me back my son!" The monks joined the poor man in his entreaties; but the Saint replied, "Such miracles are not for us to work, but for the blessed apostles. Why will you lay upon me a burden which my weakness cannot bear? " Moved at length by compassion he knelt down and, prostrating himself upon the body of the child, prayed earnestly. Then rising, he cried out, "Behold not, O Lord, my sins, but the faith of this man, who desires the life of his son, and restore to the body that soul which you have taken away." Hardly had he spoken when the child's body began to tremble, and taking it by the hand he restored it alive to its father. Six days before his death he ordered his grave to be opened, and fell ill of a fever. On the sixth day he requested to be borne into the chapel, and, having received the body and blood of Christ, with hands uplifted, and leaning on one of his disciples, he calmly expired in prayer on the 21st of March, 547. Pope Paul VI proclaimed Benedict patron of Europe (Feast in Europe) on the 24th of October, 1964 (Apostolic Letter: Pacis nuntius).